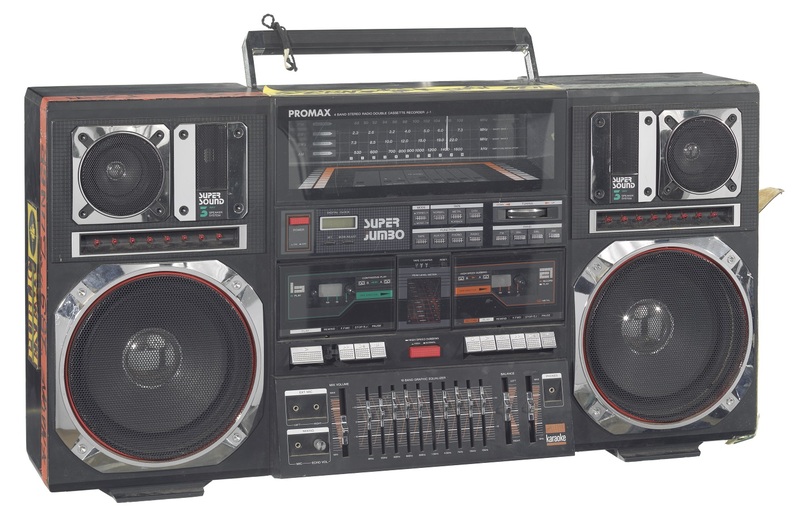 Boombox carried by the actor Bill Nunn as Raheem in Spike Lee's, Do the Right Thing. After the film, Lee inscribed the words “Fight the Power” and “Radio Raheem Lives” on the boombox before giving it to film critic Gene Siskel. Lee’s signature and inscriptions are also visible on its back side. Public Enemy stickers adorn the left and right sides, while the names of individuals and crews are tagged, graffiti-style, along the boombox’s edges. You can find this oversize mobile sound system in the Museum's Musical Crossroads exhibition as one of the iconic objects from the 1980s, and explore more Hip-Hop history in our Collection.